The La Vie en Rose Paper Packet is lovely and fully of drama as I always find black and white to be so striking. 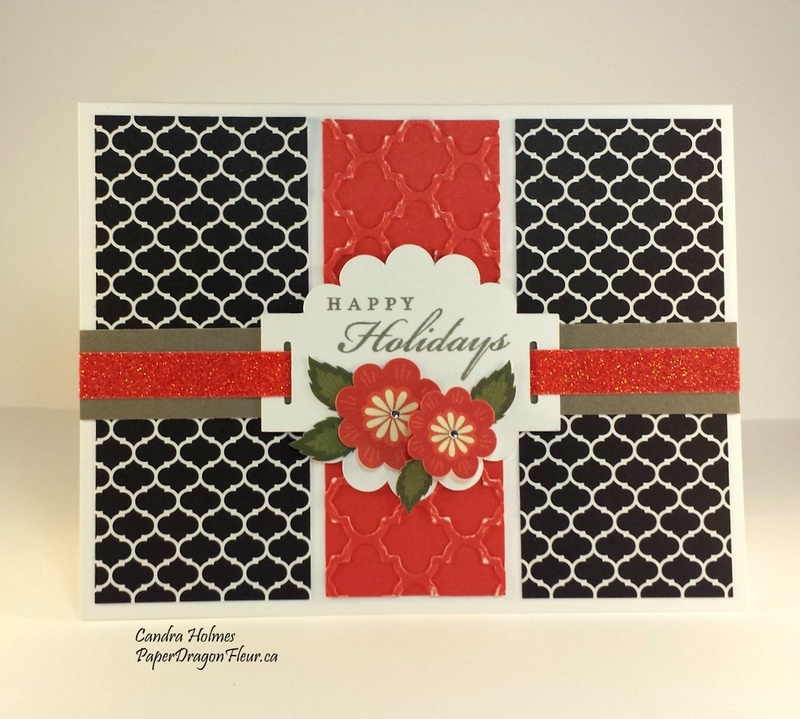 For this card I paired the quartrefoil patterned papers from La Vie with a new colour called Poppy, which I embossed using the Quatrefoil Embossing Folder and lightly sanded it to bring out the white core. For some sparkle and to add more colour I then added the Coral Shimmer Trim (on a Slate cardstock base) and a few of the pretty flowers from the White Pine Complements. The white daisy piece was cut from the Cricut Art Philosophy Collection and the sentiment is from the Pear & Partridge Scrabooking WOTG from a few years ago. I try not to use retired sentiments and stamps in my workshops but this one just fit the card perfectly. I am going to submit this card to Color My Heart Color Dare #165 which is to use Ruby, Slate, Black and Whisper. I did use Poppy instead of Ruby and no Whisper but... I think it should be ok.
What a beautiful card! Love how you did the sentiment. Thank you for inspiring us at Color My Heart Challenge Blog. Great card, Candra! I love the shimmer trim slide and the dainty little flowers on the sentiment label. Thanks so much for sharing this lovely card with us at the Color Dare! Beautiful card! Love the way you carried the quatrefoil over to the poppy. Thank you for playing along with us this week on Color My Heart.